James Walker took his first Superleague Formula points of the season with three top finishes at the Assen TT Circuit in Holland this weekend. 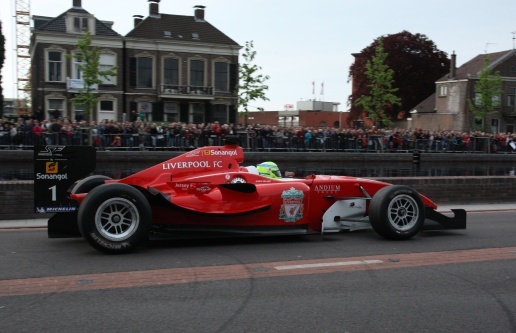 Driving the Liverpool FC car, the Jersey racer finished in sixth place in races one and two and then stormed to fourth in the five-lap Super Final. After a disappointing start to the season at Silverstone in April, James was keen to take a good haul of points in Assen. The weekend actually started on a low note when he didn’t make it out of the group stages in qualifying, coming sixth in his group. He wasn’t the only top driver off his mark though as in the other group, Silverstone-winner and ex-F1 driver Sebastien Bourdais, also found himself in sixth place at the end of the session. James lined up on the grid for race one in 11th place, knowing that he had a tough race ahead of him. He fought his way through, all the way up to seventh, then a fantastic move around the outside of the other Silverstone-winner, Craig Dolby, secured sixth place for James. It was a good effort from the Jerseyman and it secured him his first Superleague points of the season. Race two has a reverse grid and James’ sixth place in race one earned him 12th place on the grid so again he was going to have a busy time on the track. The combination of James’ two results earned him a place in the coveted five-lap Super Final, otherwise known as the ‘Dash for Cash’! Ash clouds permitting, James will travel home tonight before heading straight off to Magny Cours for the next event on 22/23 May.